We've been manufacturing Dee-Zol multifunction additive since the 1950s. And we love hearing from our customers and how it's been working for them. One of our customers, Michael Forsythe, dropped us a note in May about using Dee-Zol and what it was doing for him. 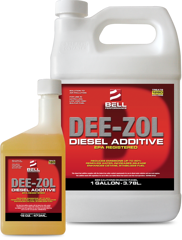 I have used Dee-zol since buying my 2015 lml. I've been happy with the results: truck runs smoother, cleaner, more efficient, and with more power (seemingly). I used during the cold months this last winter with winter fuel, and no other additives, and had no issue with gelling, cold starts, or poor performance. The university study was helpful to me in determining which additive to use, and I suggest you read it, if you haven't, and consider it. Thanks, Michael, for letting us know about your positive experiences with Dee-Zol. Big Rig driver gets 17% MPG increase.